US book retailer Barnes & Noble has once again cut the price of its Android tablets as it seeks to cut its losses in the tablet market and bow out with a bit more in the coffers. The 7-inch Barnes & Noble Nook HD tablet, which packs a very decent 1440 x 900, is now up for grabs for just £79 (8GB) and £99 (16GB). That's another £20 off the existing price cuts, put in play earlier this year. 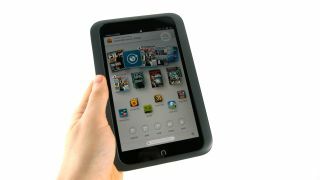 The company has also knocked a few quid off the 9-inch Nook HD+, which has a full 1920 x 1080p display. The 16GB model is now just £129, while the 32GB slate can be nabbed for £149, while stocks last. Barnes & Noble has signalled its intentions to exit the tablet market earlier this year after poor sales in the face of stiff competition from the Amazon Kindle Fire and Google Nexus 7 devices. Instead, the company plans to license its name out to other manufacturers. The tablets arrived in the UK in November 2012 and earned praise for its hi-res display and slim, lightweight body, but were criticised for their ugly design, custom UI and sluggish performance. Despite not being overly popular with consumers, the newly reduced may represent a real bargain for those who enjoy rooting their Android devices to access the raw version of the operating system. The Register points out that both devices can be easily rootable using the CryogenMod firmware hack. Just remember all of the usual garb about doing so at your own risk and voiding warranties.